The key to preventing terrible scenarios on your ACT test day is proper preparation. It’s not just about studying for months, but preparation to ensure everything goes as planned for the test day. Getting stuck on a question is bad, but breaking your pencil in the middle of the test has been just as disastrous. Part of acing the ACT test is knowing and Coso how do you go about with these? A printed copy of your admission ticket. Log in to your account on the ACT website where you registered and print out your admission ticket. Only the paper copy of this document is allowed on the ACT test day. Images of this ticket on your mobile phone or other electronic devices will not be accepted. A valid photo ID. The full name and photo on your ID should match what’s on your ACT registration. Which valid IDs can you use on the ACT test day? If you don’t have any of these, have a school official or a notary fill out a downloaded copy of an Official ACT Identification Form. If you took part in the ACT Talent Search, you should prepare a copy of your talent search identification letter. At least two pieces of #2 pencils and a good quality eraser. Always make sure to have a spare pencil in case the one you’re using breaks. Pens, mechanical pencils, liquid paper, highlighters and other writing accessories are not acceptable, including for the ACT essay test. An approved calculator. Although there are particular limits, the ACT allows 4-function, graphing and scientific calculators for the test. Be aware of the of the limits and uses of the calculator in the ACT. 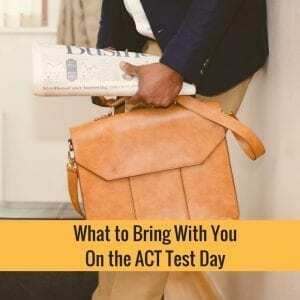 On the ACT test day, it is vital that you bring with you. Your admission ticket, valid ID, and calculator. These are ACT test requirements that you need to enter your testing room. Additional #2 pencils and a small, handy pencil sharpener. These are essential backups should mishaps take place while you’re taking the test. They will bring you much-needed convenience if you’re taking the ACT Plus Writing test where you will need to write an essay. Extra calculator batteries. The last thing you would want to happen while taking ACT Math is to have a dead calculator. That’s why you need to bring extra batteries for this test accessory. In fact, it makes sense to put new batteries in your calculator on the day before the ACT test. See to it that your calculator is operating well a day before taking the test as well. Snacks and drinks to replenish you during your breaks. 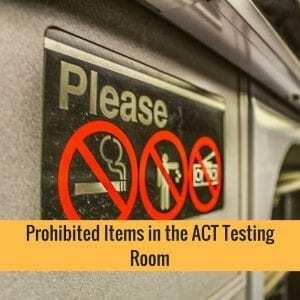 Although eating is not allowed in the testing room, The ACT test schedule includes breaks. Bring nutritious snacks and drinks with you to energize you on this long and important test. A noiseless watch with no audible alarms. This comes in handy because you’ll need to keep track of the time when taking the different sections of the test. Don’t forget about the time limit for every section of the ACT. 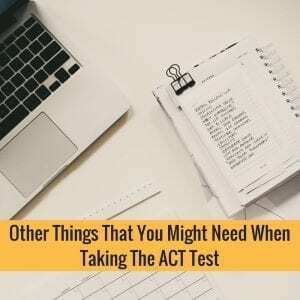 You need to be aware of the time when taking the ACT test. But this is an optional ACT test requirement, specifically if it distracts you or causes anxiety. Technologies with recording or communication capabilities. The only technology allowed in the ACT testing room is the calculator. Laptops, cell phones, cameras, and tablets, among others, are not allowed. Security is maximized on the day of the ACT test. Anyone caught cheating will be investigated and reported in the news. Be aware that there were high-profile SAT cheating scandals that ruined some students. Those caught cheating on the ACT test can be expelled from their schools and have their scores canceled. Some were even banned from entering college. Dictionaries, translators, textbooks, notes and any other documents. The only document that’s allowed on your desk is your ACT test booklet. Other reading materials or “cheat sheets” are restricted. Other writing tools, except for #2 pencils. 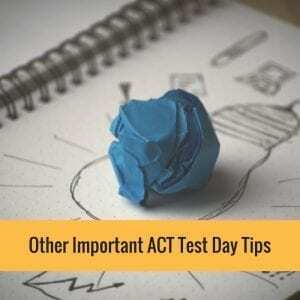 ACT test prep can start from many months until the test day as well as the night before that schedule. It is just as crucial to study and be prepared for the different test topics and get your gear ready the night before. Pack every necessary item in your backpack the night before the ACT test day. Your backpack should be prepacked as you are all set and ready on the morning of the ACT test. Have an extra copy of your admission test ticket. A back-up for this requirement could be useful. Prepare this a few days before the test and not during the last minute. Because anything can happen, such as printers breaking and so on. Eat a nutritious breakfast. Make sure that you are physically ready for the test. Go on with whatever routine exercises that you do every morning, and don’t forget to pack your snacks and drinks. Your morning on the ACT test day should be stress-free and relaxed. This will help you to be emotionally and mentally ready for your long-awaited feat. Remember not to bring your cellphone to the testing room. It is not enough to silence your phone because you wouldn’t want to risk having your ACT score canceled. Leave it outside! Make a checklist and make sure all the ACT test requirements discussed in this article are in your backpack. With everything ready, you can focus all your attention and energy on doing your best so you can ace the ACT test. If you do this right, you can easily gain admission to the higher learning school of your choice.